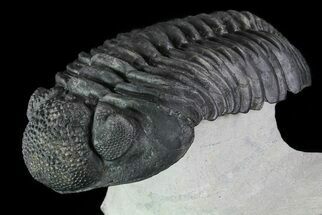 This is an incredibly rare trilobite from Jorf, Morocco. I only know of a handful of complete Radiaspis ever found in Morocco (Issomour), and this is the only one I've seen or heard about from Jorf. 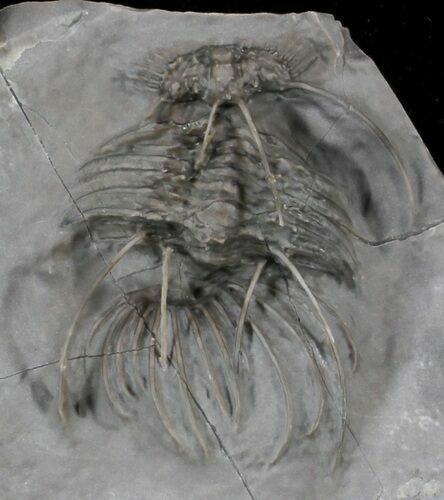 It's almost certainly a new, undescribed species. It's 1.05" long, and several of the spines have been free-stood. I collected this locality when I was in Morocco in November. The rock at this site is partially metamorphised, massive and has no discernible layers. 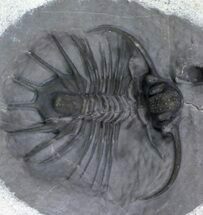 It's almost amazing that there are well preserved trilobites in the rock given the geological changes that it has gone through. 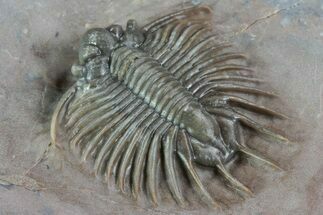 Unlike nearly all other trilobite localities in Morocco, there are no layers that can be followed. This means that collecting mostly involves breaking down the boulders on the surface. The rock is pretty limited, so it's not like other localities where diggers can simply follow a layer for miles. The rock also has a glass-like property which makes preparation extremely difficult and time consuming. The last two photos shows us collecting the locality.